Shapes are everywhere! 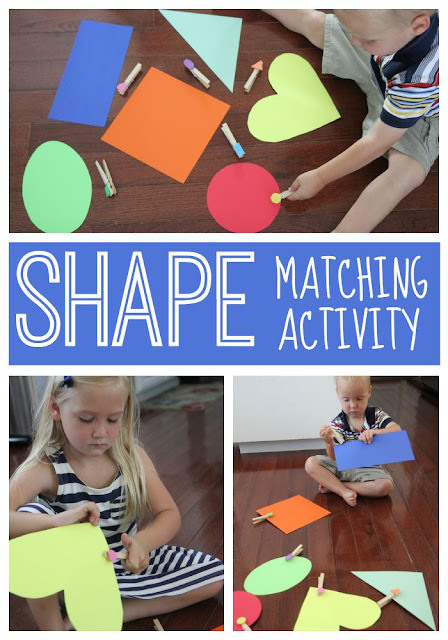 Kids love to learn shape names and identify them in their environment. "Color and shape are ways children observe and categorize what they see. These very recognizable characteristics encourage children to define and organize the diverse world around them." You can read more about why colors and shapes matter over on Scholastic. Today we're matching small shapes to larger shapes using clothespins for a really easy Shape Clothespin Matching Activity. 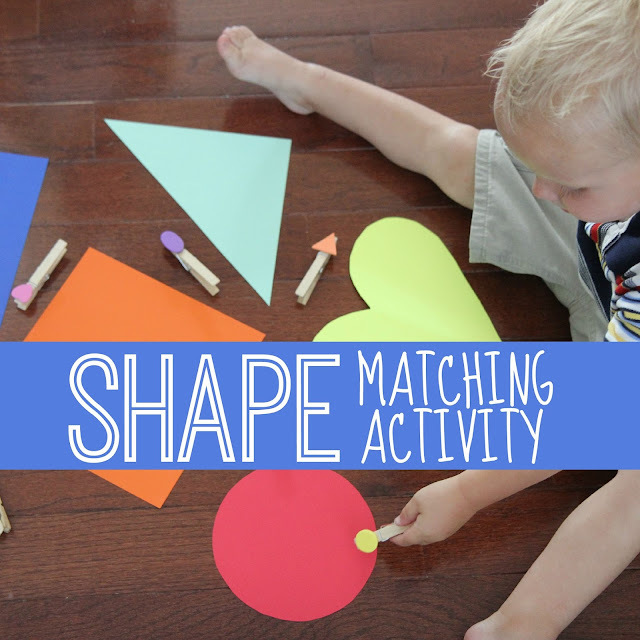 Today's activity will focus on shape recognition and matching. Yesterday we explored numbers 1-10 with a number toy hunt and on Monday we did a name art activity and game. Start by cutting out several large shapes from cardstock. We cut out rectangles, squares, triangles, ovals, hearts, etc. Next glue or tape a foam shape onto each clothespin. Make several clothespins with each shape on them so that you have several clothespins that match each large shape. Once the clothespins are prepped and the shapes are cut out you are ready for our matching activity! You may want to laminate the large cardstock shapes before playing with them. Only put out a few at a time so that you don't overwhelm your child! To do this Shape Clothespin Matching Activity just spread out the clothespins and large cardstock shapes on the floor or table. Work together (or individually) to clip each small shape clothespin to its corresponding large shape. Once you are done, remove the clips, mix them up, and try again! This is such a great activity for strengthening finger muscles and working on fine motor skills and hand-eye coordination. Toddlers and preschoolers love repetition and this activity can be done again and again. It is also a great quiet time activity for kids (with supervision, since the clothespins can break). My 2 1/2 year old and almost 4 1/2 year old had so much fun with this activity! 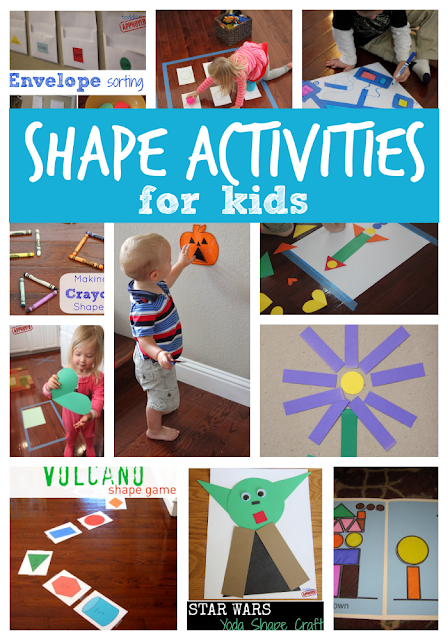 Need some other shape craft or activity ideas? Try out some of these 25 shape crafts and activities that we love!